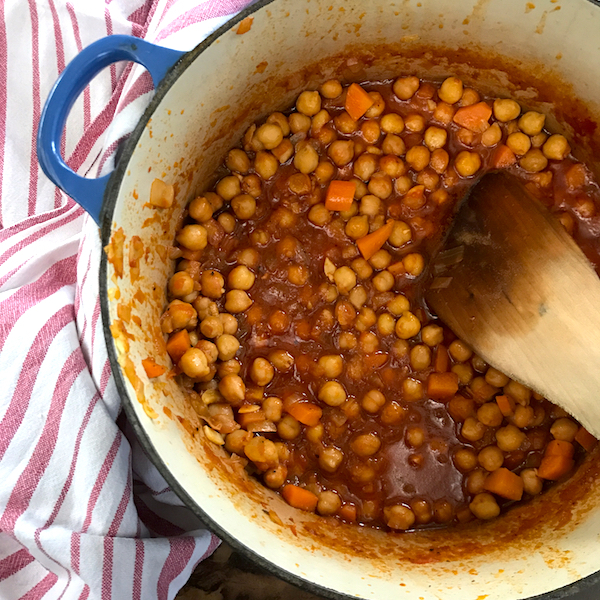 Canned chickpeas are a staple in the vegetarian store cupboard, not only are incredibly convenient, they are an absolute life saver when you need to make a quick and easy dinner and the cupboard is almost bare. These Spanish chickpeas meet the super easy and simple ingredient criteria but they really benefit from a long, steady simmer on the stove top. The deliciousness comes from the layering of flavors the browning of the soffrito of onions, garlic and carrots, and the slow stove top cooking allowing the sauce to thicken and caramelise around the edges of the pot. Years ago I bought a slow cooker and ended up giving it away after about six months because everything I made in it was bland and tasteless. I couldn’t understand what I was doing wrong but eventually realised slow cookers only cook from the bottom of the pan so there’s no caramelized ring around the edge to be stirred back into pot. Weather permitting these chickpeas can also be baked in the oven for even more browning and caramelization as they cook. I once worked for an excellent Syrian cook whose pro tip for stews and casseroles was to always cook them in slightly oversized pans. This increases the surface area and enhances the browning and caramelizing process and creates a more flavorsome stew. This is why sauteuse pans which are lower and wider than a saucepan are so excellent for slow braises and casseroles. The other important thing about this stew is to only add enough liquid to just cover the chickpeas. It’s better to add extra liquid as the sauce cooks down, then have the chickpeas swimming in a watery sauce as they cook. Once you get these chickpeas on they’re very low maintenance and only need to be occasionally stirred and have more water added if needed. Get them on early and let them cook for an hour or so. Serve with a simple rice pilaf like everyday party rice, feta and a salad. Heat a large Dutch oven and add a generous layer of olive oil. Saute onion and carrot until starting to become golden around the edges, then add garlic saute until transparent and fragrant. Add smoked paprika and pepper flakes and saute until fragrant. Add can of crushed tomatoes, bay leaf, oregano, sugar and salt to taste. Allow to cook down for about 5-10 minutes. Add chickpeas and enough water just to cover the chickpeas. Simmer uncovered for an hour or so, stirring occasionally and adding more water if needed.